A series inspired by the 'Sahara Desert', with undulating satin gold surface textures, and colours reflecting the natural environment and ocean. These pieces are finished in satin gold plate with Swarovski crystal, paste, wooden effect cabochons, natural turquoise, semi-precious stones and leather. 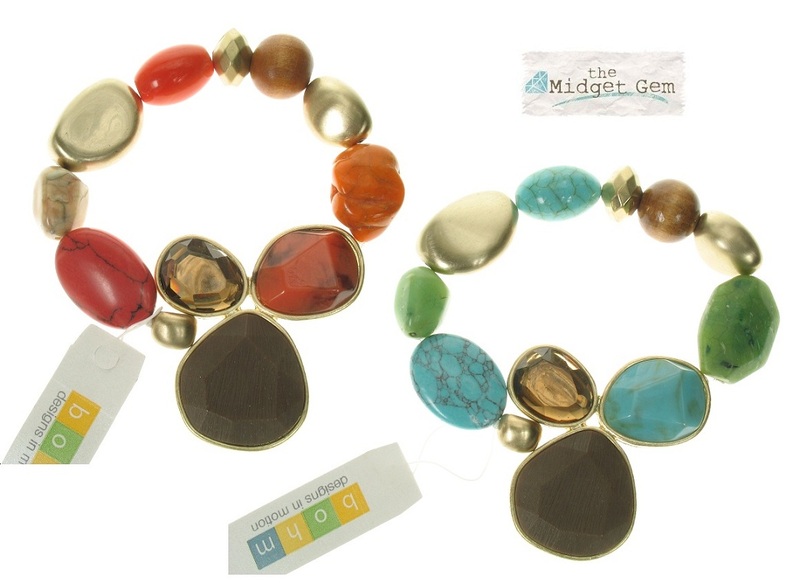 Available in gold/coral/brown and gold/turquoise/brown. 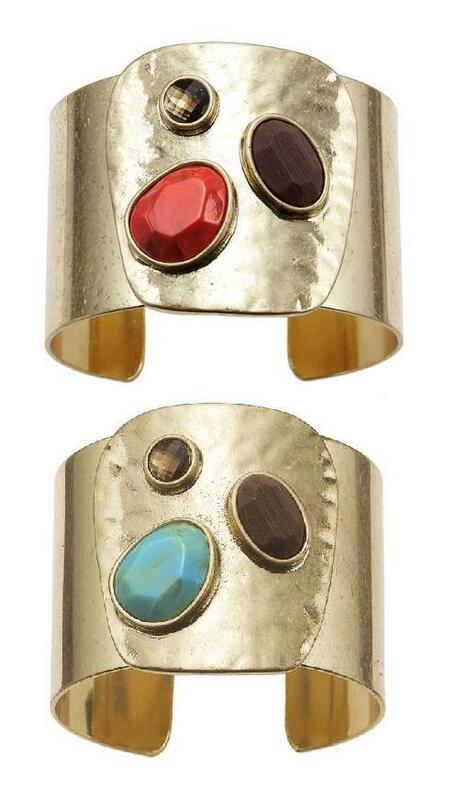 Wide cuff bracelet. 'Beaten' effect front panel. Swarovski crystal and cabochon details. Diameter 6cm/60mm. Inner circumference approx. 18.8cm/7.5 inche. 4.3cm/43mm wide. Can be gently expanded/contracted to fit the wrist. Satin gold plate. Choice of colours. Jewel cluster with cup-set cabochons of crystal, wood and semi-precious stones. Diameter of cluster detail 2.5cm/25mm. 5mm wide band. Adjustable - can be gently expanded/contracted to fit the finger. Choice of colours with satin gold plate. 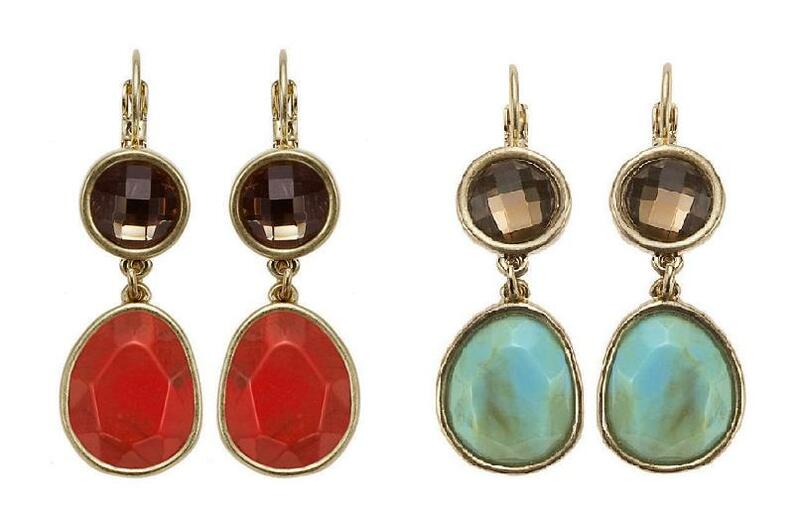 Jewel drop earrings. Satin gold plate finish. Swarovski crystal and cabochon details. French clip for pierced ears. Total length 4.8cm/48mm. Upper most jewel measures 1cm/10mm. Cluster pendant necklace. Three framed 'jewels' suspended from a double leather cord (colour:dark brown). Swarovski crystal, semi-precious stones and wooden cabochon details. Pendant measures 4.3cm/43mm x 4.5cm/45mm. Adjustable length 40cm/16 inches to 48 cm/19 inches. Satin gold plate. Choice of colours. 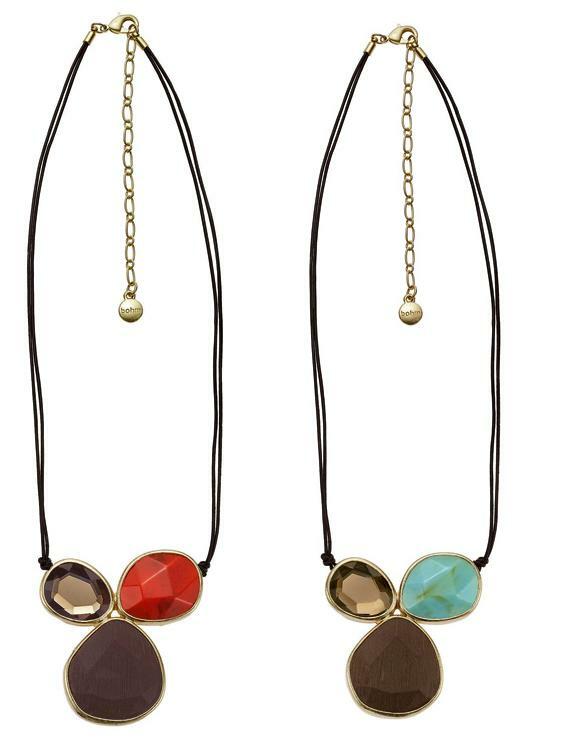 Beaten effect focal with a jewels and wooden effect cabochons set-into it. Diameter of cluster detail 2.8cm/28mm x 2.5cm/25mm. 5mm wide band. Adjustable shank - can be gently expanded/contracted to fit the finger. Choice of colours with satin gold plate. Stretch style bracelet with a Jewel cluster motif, cup-set cabochons of crystal, wood and semi-precious stones. Diameter of cluster detail 5cm/50mm. Various paste, wood and semi-precious stone beads, measurev 1cm/0mm up to 2.5cm/25mm. Inner circumference approx. 7 inches/18cm - unstretched. Choice of colours with satin gold plate.